The launch reception (all in English) was itself an innovative, light-hearted event. Artistic Director composer Ivo Nilsson introduced himself by entering with his trombone to play Berio's classic Sequenza which, he explained, was based on the phonemes of the word WHY; why this seemingly limiting theme for a whole week's music making? Doubts about the adequacy of this musical by-way for a whole festival were quickly dispelled in the first concert by the seven members of Neue Vocalsolisten Stuttgart , the vocal ensemble in residence. They gave a brilliant exposition of the diverse approaches to speech/song by six composers, received enthusiastically by a large, very mixed audience. The featured composer Georges Aperghis celebrated the 'indefatigable urge' of schizophrenic artist Adolph Wölfli to express himself in all the arts with a frenetic stream of vocalisation; Sciarrino explored 'dissolution of words into pure sound, with 'sighing, swelling phrases of Petrarc describing a desolate view of eternity'. Of lesser known composers, Walter's 'breathing, sighing and whispering' treated the 'veiled transition between Nothing and Sound of voice' and Tadjikistani Nurulla-Khoja made a mark with her poetic exploration of Sufi-related 'fragments of perfection at the outer limits of hearing'. Hoffmann explored the multifarious meanings of the word 'stimmen', and Bauckholt, with a composition built upon all possible nuances voicing current German phrases and words, Ja, aber, OK etc, brought the evening's proceedings to a hilarious finish, and although there were virtually no ordinary 'melodies' the precision and sheer musicality of all they did was incontrovertible and their contributions during the week left no room for doubt that each member of the Neue Vocalsolisten Stuttgart can sing 'properly' too. Whether the French soprano Donatienne Michel-Dansac (we missed her second appearance) could do so was left far from sure by her contribution, in an under-projected white 'little girl' voice, to Feldman's setting of Beckett's Neither (1977), heard next day in Swedish Radio's impressive Berwald Hall, the building carved out of solid rock. Under Love Derwinger the 90-strong Norrkopings Symphony Orchestra displayed full command of its interesting timbres and rhythms, but of the ten-line libretto we caught only the one word impenetrable from the line 'from impenetrable self to impenetrable unself by way of neither', which established that she was singing in English and summed up aptly a daunting 60 mins experience. American mezzo Christina Ascher deployed her rich operatic voice and theatrical skills in a solo recital at the Börssalen, an acoustically perfect ornate hall in the Swedish Academy. It began, as had the festival too, with a seminal Sequenza , the one Berio composed originally for his then-wife, Cathy Berberian. It was an exceptional rendering, followed by an hour of varied vocalisation. Dinescu's Quatrain, a setting of an angry François Villon expecting to be hanged (he wasn't), Stabler's gargling song and Cage's music-drama Aria (1958) were high spots in an entertainment of consummate professionalism, to remind us of the long history of this musicdrama tradition. One very special event was a remarkable choral concert, every item with electronics - that believed to be unique - corrections to the claim were invited. Stockholm Motet Choir under Olof Boman performed Rolf Enström 's Shakespeare setting Rama, featured in his monographic CD launched after the concert (Phono Suecia PSSACD 153) and then they gave way to children of the Södra Latins Gymnasium under Jan Risberg, an inspiring teacher of conducting and new music. Difficult pieces by student composers were performed with confidence, entries pitched with individual tuning-forks as is the custom. Pär Frid's unfinished work in progress go cycle(swinging loud-speakers yet to be incorporated) left the conductor alone on stage as the choir descended into the audience, and the ebullient Benjamin Staern * broke the mould for polite acknowledgement of applause for his Through air and noise by thundering down to the platform, bowing deeply to his peers on stage and then to us, spreading his arms, leaping into the air and whooping with delight like a footballer who'd scored a goal; there's a model for our staid British composers! Football, with many other competitive sports and more peaceful outdoor pursuits, figured at the Royal Swedish Opera in an ambitious parable about life and death, Sports & Leisure by Thomas Jennefelt to a libretto of Niklas Rådström. This is a complex second opera by a composer of minimalist tendency, but much more than that; Jennefelt is adept at writing sympathetically for opera soloists and chorus. Music theatre at its best, Sport & Fritid is a debating ground about ideas and ideals, moral conundrums and politico-social issues. In her office, Laura gets hit on the head by a football and knocked out.... Beneath some superficial jollity lurks a deadly serious critique of destructive social values and codes of conduct, inherent in obsessive competitive sport, values that promote winning at all costs - costs to self and at the expense of one another and of 'the other' who must be put down to inflate self esteem. Jennefelt and Rådström toss the ball to the audience; do we continue to play according to destructive and restrictive rules, or is there another way? Their protagonist Laura, a part superbly embraced in all its complexity by lyric soprano Lena Hoel, works her way through the moral maze explored in depth by the creative team. 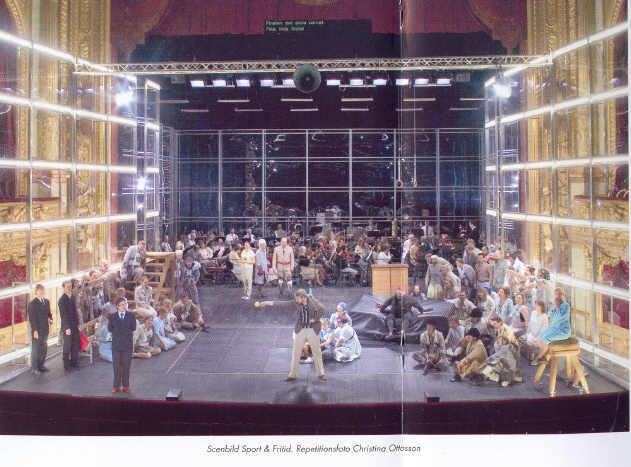 A general impression of the total transformation of Stockholm's gorgeous, traditional opera house is provided by the rehearsal photo of the last scene, taken from the lavishly illustrated programme; it was particularly frustrating being unable to follow the extensive essays and dialogues. Despite striking visual clues a-plenty to the thrust of the argument, language was a severe impediment for us, precluding a full review. The singers, dancers and gymnasts were excellent throughout, as was the choreography and movement co-ordination of the large cast. Unquestionably, Åsa Melldahl 's astonishing and costly revival of Sport & Fritid at the Royal Swedish Opera is deserving of a wider audience. We trust this was recognised and that the opportunity was not lost to film it for a DVD with the usual multi-lingual subtitles? A worthwhile project for a forward-looking sponsor. The vocal/instrumental ensemble Volker Staub gave a semi-improvised 1¼ hour work Suarogate which seemed to be in several sections, but applause between them was suppressed and it all felt over-controlled. Alongside voices and conventional wind instruments, they had developed several on display themselves from wood, steel string and engine sirens, all deployed with never a smile or feeling of any joy in music making or of warm relationships between the group members. Cage & Riley had done it all c. 1940, in their Constructions - imperishably, so it has transpired. The Volker Staub musicians had their eyes glued to scores, the singers pitched entries with tuning forks, everything progressed painfully slowly; a dispiriting event which sadly left us too exhausted to set off to another venue for late night Henze (El Cimarrón ). Next morning my participation in the festival was suddenly interrupted by fainting during Anna Pajunen's recital with video and electronics; I'd enjoyed her own work Memo about various aspects of memory, and an Aperghis Recitation was going well before I was hauled out to hospital, so I missed the third performance during the week of Cage's Aria! Two days on, the Battistelli concert by the extended percussion group Ars Ludi was a high point in the series of lunch time concerts in the very central Culture House, all taken by Swedish radio. Two drummers enacted a famous ancient Roman duel between the Orazi and the Curiazi, with vocal interchanges and the crunch of marching feet giving the work a less abstract feel than most percussion duos. In the extended monodrama Aphrodite, Silvia Fanfani Schiavoni was utterly captivating reciting an Italian text inspired by Pierre Louÿs, supported lightly by three percussionists (fingers dancing on marimbas) harp and flutes (breathy sounds from a huge pan-pipe). KammerensembleN is a flexible group equivalent to UK's London Sinfonietta and, on their showing during the festival under Franck Ollu, of comparable standard. Liza Lim's ecstatic Sappho setting creates ambiguity between singer and instruments, with Ivo Nilsson's trombone notably as vocal as the voice. Unsuk Chin's Acrostic Wordplay (1991-03) deconstructed texts including passages from Alice in Wonderland against coruscating microtonal textures. Olga Neuwirth's ecstaloop confronted listeners with 'a cosmos of multiple layers abuzz with a whirlwind of sound and speech - - highly demanding of the listener's perceptive abilities....'. Henrik Strindberg was more approachable in text settings which were framed by Lachenmann-like sounds from the instruments giving way disconcertingly to more populist musics. Eclectric Guitar Experience attracted a crowd which crammed the space of the little Galleri Aguéli with many more people than any fire officer could contemplate permitting, but Marten Falk's mixture with videos (best, a woman endlessly peeling a leek) was insufficiently developed for an international festival, its pretentious claims to have created 'electric aesthetics' far from justified. James Wood conducted the crack Swedish Radio Choir in an exciting tour of contemporary choral writing. Ligeti's Holderlin Phantasies were commissioned by the choir and premiered by them in 1983. Wood's own Incantations (1991) use a complex web of sounds from 'sung' through 'sung speech' to 'spoken' in an imaginary 'composed language', its melancholic coda reflecting the composer's feelings about the massacre of the innocents in the Gulf War. Kent Olofsson's newly completed 40-mins setting of Poe's The Bells plus other texts for choirs and instruments (with percussionists and soloists moving around the platform so that sounds 'can swing to and fro over the stage') was long in gestation and redolent of the '80s, the time when it was conceived. The sound was duly thrilling in what must be one of the greatest radio concert halls in the world. At the closing reception, Ivo Nilsson explained that he had seen his role more as facilitator than director. The final event, conceived as a cabaret-type entertainment with drinks at the tables in the festival's centre Nalen, turned out to be an over-serious four-hour concert with four intervals - hits and misses! John Cage, a 'father figure' for the festival theme, was ill-served posthumously by a deconstructed film of his face and voice taken from an interview that would better have been excerpted straight. Björn Granath delivered some more Aperghis poems and Irish composer Jennifer Walshe, a real original, gave a virtuosic rendition of the esoteric languages of several frog species as well as persuading the Stuttgart Solisten to demonstrate the monotonous tedium of the actual life of media-romanticised cowboys. Soprano Ibba Andersson with her regular collaborator Kristine Scholz impressed greatly in an extended group of songs and music-drama pieces by composers Holliger, Persson, Jennefelt and Gefors. We left before the very end, but with the haunting memory of James Wood's Autumn Voices (2001), violinist Hae-Sun Kang (who had given Unsuk Chin's Grawemeyer prize-winning violin concerto earlier in the week) expounding a subtle score with the composer as triggerist mediating his electronic counterpart with the 'songs of many birds'. As explained earlier, our coverage had necessarily been less balanced than hoped and we wer unable to attend any of the ancillary event, seminars, master classes etc, many of them given in English. The atmosphere was notably friendly and informal and the arrangements and dissemination of information excellent. We found the calibre of Swedish contemporary music and musicians, and the preparation and presentation of their programmes, was as high as anywhere. Next year's Stockholm New Music will have as its theme Place and Space, under the artistic direction of Magnus Andersson; pencil it in your diary for February. 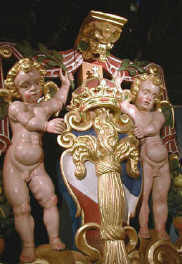 Sweden, in common with many smaller nations, does have difficulty in promoting its new music and recordings, several of which were received during the festival. The substantial output of contemporary music can be explored on the websites of Phono Suecia and Caprice Records. It is hoped to review a wider selection of these on Musical Pointers in due course. 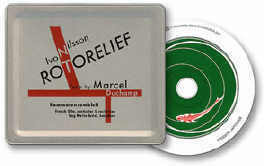 Most unusual of those presented to us in concept and presentation was Rotorelief by Ivo Nilsson, to texts by Marcel Duchamp, recorded by KammarensembleN/Franck Ollu; brilliantly evoking the Dada atmosphere and wholly enjoyable. * A fascinating range of works by Benjamin Staern has been received on a promo-CD. Details, and listening excerpts, on his website. I was able to attend two days of Stockholm New Music this year. The concert at Berwaldhallen with Swedish Radio S.O. conducted by Niklas Willén was impressive. Though Anders Eliasson's music is very strongly related to tradition, I think he's a great composer. His 40 minutes Sinfonia per archi was very lush and densely composed. It was said that it was in three movements but it felt more or less three big sections of different characters. It was an fantastic experience! 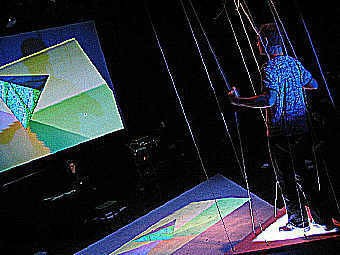 A premiere performance for Laporte-instruments and orchestra by Jesper Nordin was called Residues . The specially constructed instruments, built by Canadian fellow composer/inventor Jean-François Laporte, looked like satellite dishes from outer space! They were actually balloons (called "bol" and "tuyos" in the score) serial-connected to an air-pressured compressor, such as is commonly used for cleaning dust on a grand piano. Unfortunately they weren't really audible due to the acoustics of the hall. They were many things that drove away attention during perfomance, for instance when four trombones standing on the balconies and playing slow glissandi made me wonder - but it gave a "colouring" to the glissandi of the strings. On the other hand, it was an interesting journey for your eyes and ears. Nordin's music can be described as with a sense for sound and built from residues of folk music resources. 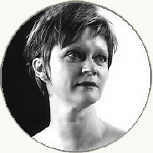 Rebecca Saunders Miniata for piano solo, accordeon, choir and orchestra ended the first concert at the Berwaldhallen, her musical language redolent of the 60-70's avantgarde. It didn't leave that much impression on me at all, but the musicians and singers as well as the conductor performed it with greatest respect. Next day I attended the Gustaf Vasa Church for a perfomance of Salvatore Sciarrino's Studi per l'intonazione del mare ("A Study of the Intonation of the Sea") for counter-tenor, flute quartet, sax quartet, percussion and orchestras of 100 flutes and 100 saxes! A really remarkable work!! I was astonished that the orchestras of flutes and saxes, consisting of students from the Stockholm area as well as teachers, could pull it together. They had rehearsed it for over a year with help of the saxophonist Jörgen Pettersson and Stig Bengtson, who went around the schools and taught them how to create these 'unusual' sounds on saxophones and flutes. Much credit to all the youngsters, amateur musicians and teachers who participated in this project, as well as the soloists Mikael Bellini, counter-tenor, a flute quartet (Sarah Lindloff, Sara Hammarström, Karin Lektéus, Gabriella Lundgren) Hässlo Saxophone Quartet, Pontus Langendorf on percussion, conducted by Jan Risberg, who gave a warm and wonderful communication as well as having taught the flute and sax orchestras. Nearly 600 (!!) people showed up at the concert, parents, friends, musicians, composers and others interested. After a magical moment and terrific performance of Sciarrino, I went further on to the Deutsche Kirche at Gamla Stan and listened to a concert with Monteverdi's Sestina-madrigale for choir and consort and Nono's Das Atmende Klarsein for small choir, bass flute and electronics. It was performed by the Harmony of Voices from Sweden ("Svenska Vokalharmonin") led by Fredrik Malmberg. I liked the Monteverdi very much and want to get to know his music better. Nono's music felt "older" in a sense, since that modernism we know of has declined.So now we live in a new exciting period in which I will not even make an effort to create an -"ism". I don't like "-isms". It was very nicely performed by the singers and also well-done with the electronics that "shot" the flute sounds on four leadspeakers placed around the church. I followed most of the remaining concerts on the radio. I liked Heiner Goebbel's Surrogate Cities , he's a composer who's into cross-over genres and styles in music, making a really original attempt to put together different kinds of music.